Canach, Luxembourg - December 12, 2007 - MacBreakZ 4.7, your personal ergonomic assistant, adds two new stretching routines from British illustrator Nick Miller, bringing the total up to 42 stretches. 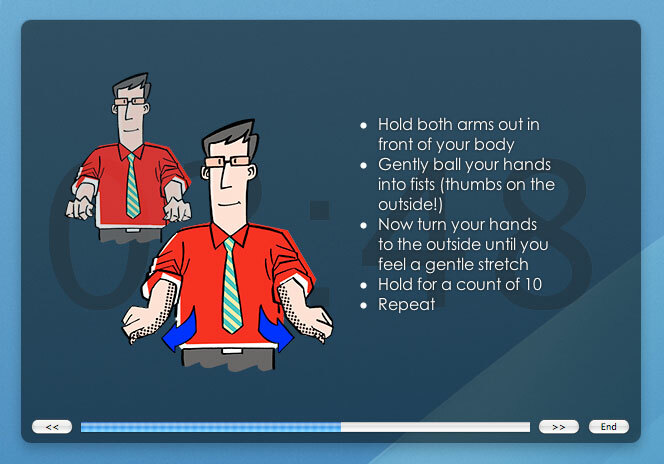 Nick's illustrations demonstrate stretching routines designed to relieve muscular tension, prevent headaches and more serious computer-related injuries. Each stretch is illustrated both in an "informal" style suitable for home users and a "business informal" style suitable for the workplace. * Single User Licenses for MacBreakZ may be purchased for $29.95. * Small Business, Family, Business and Enterprise licenses are also available. MacBreakZ is a sophisticated Personal Ergonomic Assistant designed to promote healthy and productive computer use. It uses a sophisticated activity monitor to minimize disruptions by ensuring that the user's activity level justifies a stretch, rest or micro-break. publicspace.net was founded by Frank Reiff in 1996 with the aim of producing affordable best-of-breed software for the Macintosh. In the past decade, our A Better Finder series of file utilities and our MacBreakZ personal ergonomic assistant have become familiar fixtures of the Macintosh community. publicspace.net is also active in the Windows software market.